Ivan and Brenda chose The Acre in Orlando for their beautiful ceremony and reception. Located just minutes away from I4 in the heart of the Edgewater neighborhood of Orlando, The Acre is an eclectic gathering of building and spaces that transport you our of the hustle and bustle of city life, into a more calm oasis in the heart of the city. Melissa with Juniper Events coordinated every detail for the couple. From overseeing the set up of vintage furniture from A Chair Affair to the tent from Rentaland, every detail was accounted for. Adam from Orlando DJ and Lighting, lit up the tent with market lighting and keep guests on the dance floor all night long. Flowers by Lesley crafted the beautiful arrangements for each of the tables as well as the beautiful bouquet Brenda carried down the aisle, Ivan’s boutonniere and all the flowers for their attendants. Black Bean Deli provided the incredibly delicious Cuban themed food for the evening. George Street Photo captured every moment of the couple’s amazing day. 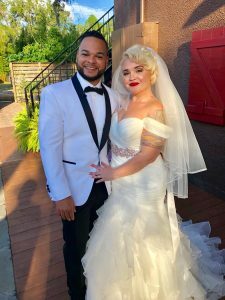 From their getting ready pictures to photos with the Rolls Royce, from the ceremony through the reception; they got it all. Rev.Glynn Ferguson with the Orlando Team of Sensational Ceremonies worked with Ivan and Brenda to create custom ceremony. Full of love and laughter, the ceremony brought both smiles and tears to their faces and those of their guests. The couple chose “The Art of Marriage” for a special reading during their ceremony. Congratulations Ivan and Brenda! We wish you a happily ever after for a lifetime.